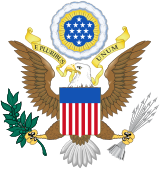 The Corwin Amendment is a proposed amendment to the United States Constitution that would shield "domestic institutions" of the states from the constitutional amendment process and from abolition or interference by Congress. Although the Corwin Amendment does not explicitly mention slavery, it was designed specifically to protect slavery from federal power. Congress proposed the Corwin Amendment on March 2, 1861, shortly before the outbreak of the American Civil War, but it was not ratified by the requisite number of states. In the period after the 1860 presidential election, several Southern states announced their secession and eventually formed the Confederate States of America. During this period, several legislative measures, including the Corwin Amendment, were proposed in the hope of either reconciling the sections of the United States, or avoiding the secession of the border states. Senator William H. Seward and Representative Thomas Corwin introduced the Corwin Amendment, which was endorsed by President James Buchanan. The amendment had been ratified by just five states by June 1863, far short of the number required for ratification, with the amendment falling out of favor during the Civil War. The text refers to slavery with terms such as "domestic institutions" and "persons held to labor or service" and avoids using the word "slavery", following the example set at the Constitutional Convention of 1787, which referred to slavery in its draft of the Constitution with comparable descriptions of legal status: "Person held to Service", "the whole Number of free Persons ..., three fifths of all other Persons", "The Migration and Importation of such Persons". In December 1860, when the second session of the 36th Congress was convened, the deepening rift between slave states and free states was erupting into a secession crisis. The Senate quickly formed a "Committee of Thirteen" to investigate possibile legislative measures that might solve the slavery predicamet. The House formed a "Committee of Thirty-three" with the same objective. More than 200 resolutions with respect to slavery, including 57 resolutions proposing constitutional amendments, were introduced in Congress. Most represented compromises designed to avert military conflict. Senator Jefferson Davis proposed one that explicitly protected property rights in slaves. A group of House members proposed a national convention to accomplish secession as a "dignified, peaceful, and fair separation" that could settle questions like the equitable distribution of the federal government's assets and rights to navigate the Mississippi River. Senator John J. Crittenden proposed a compromise consisting of six constitutional amendments and four Congressional resolutions, which were ultimately tabled on December 31. No amendment of this Constitution, having for its object any interference within the States with the relations between their citizens and those described in second section of the first article of the Constitution as "all other persons", shall originate with any State that does not recognize that relation within its own limits, or shall be valid without the assent of every one of the States composing the Union. While the House debated the measure over the ensuing weeks, Mississippi, Florida, Alabama, Georgia, Louisiana and Texas had joined South Carolina in seceding from the Union. The contentious atmosphere in the House during the debate was relieved by abolitionist Republican Owen Lovejoy of Illinois, who questioned the amendment's reach: "Does that include polygamy, the other twin relic of barbarism?" Missouri Democrat John S. Phelps answered: "Does the gentleman desire to know whether he shall be prohibited from committing that crime?" On February 26, Congressman Thomas Corwin, who had chaired the earlier House committee, introduced his own text as a substitute, but it was not adopted. The following day, after a series of preliminary votes, the House voted 123 to 71 in favor of the original resolution, but as this was below the required two-thirds majority, the measure was not passed. On February 28, however, the House returned to and approved Corwin's version by a vote of 133 to 65, just barely above the two-thirds threshold. The Senate took up the proposed amendment on March 2, 1861, debating its merits without a recess through the pre-dawn hours on March 4. When the final vote was taken the amendment passed with exactly the needed two-thirds majority – 24-12. Soon afterward, it was sent to the states for ratification. The joint resolution containing the Corwin Amendment called for the amendment to be submitted to the state legislatures, as it was believed that the amendment had a greater chance of success in the legislatures of the Southern states than would have been the case in state ratifying conventions, given that state conventions were being conducted at that time throughout the South at which votes to secede from the Union were successful. The Corwin Amendment was the second proposed "Thirteenth Amendment" submitted to the states by Congress. The first was the similarly ill-fated Titles of Nobility Amendment in 1810. Outgoing President James Buchanan endorsed the Corwin Amendment by taking the unprecedented step of signing it. His signature on the Congressional joint resolution was unnecessary, as the President has no formal role in the constitutional amendment process. I understand a proposed amendment to the Constitution—which amendment, however, I have not seen—has passed Congress, to the effect that the Federal Government shall never interfere with the domestic institutions of the States, including that of persons held to service ... holding such a provision to now be implied constitutional law, I have no objection to its being made express and irrevocable. Just weeks prior to the outbreak of the Civil War, Lincoln sent a letter to each state's governor transmitting the proposed amendment, noting that Buchanan had approved it. On February 14, 1862, prior to the ratification of the amendment by the Illinois General Assembly, a state constitutional convention declared the amendment ratified. However, since they were not meeting as a state legislature that action was of questionable validity. The Restored Government of Virginia, consisting mostly of representatives of what would become West Virginia, voted to approve the amendment on February 13, 1862. However, West Virginia did not ratify the amendment after it became a state in 1863. In 1963, more than a century after the Corwin Amendment was submitted to the state legislatures by the Congress, a joint resolution to ratify it was introduced in the Texas House of Representatives by Dallas Republican Henry Stollenwerck. The joint resolution was referred to the House's Committee on Constitutional Amendments on March 7, 1963, but received no further consideration. On February 8, 1864, during the 38th Congress, with the prospects for a Union victory improving, Republican Senator Henry B. Anthony of Rhode Island introduced Senate (Joint) Resolution No. 25 to withdraw the Corwin Amendment from further consideration by the state legislatures and to halt the ratification process. That same day, Anthony's joint resolution was referred to the Senate's Committee on the Judiciary. On May 11, 1864, Illinois Senator Lyman Trumbull, Chairman of the Judiciary Committee, received the Senate's permission to discharge Senate (Joint) Resolution No. 25 from the Committee, with no further action having been taken on Anthony's joint resolution. A competing theory, however, suggests that a later amendment conflicting with an already-ratified Corwin Amendment could either explicitly repeal the Corwin Amendment (as the Twenty-first Amendment explicitly repealed the Eighteenth Amendment) or be inferred to have partially or completely repealed any conflicting provisions of an already-adopted Corwin Amendment. ^ Samuel Eliot Morison (1965). The Oxford History of the American People. Oxford University Press. p. 609. ^ "Constitutional Amendments Not Ratified". United States House of Representatives. Archived from the original on July 2, 2012. Retrieved November 21, 2013. ^ Daniel W. Crofts (February 13, 2016). Lincoln and the Politics of Slavery: The Other Thirteenth Amendment and the Struggle to Save the Union. UNC Press Books. p. 7. ISBN 9781469627328. Retrieved November 7, 2017. ^ David Waldstreicher, Slavery's Constitution: From Revolution to Ratification (NY: Hill & Wang, 2009), "Prologue: Meaningful Silences", 3-10, 98-9, 113. "Madison succeeded only in getting through a semantic change ... that kept the slave-trade clause from stating directly 'that there could be property in men.'" ^ "House Committee of Thirty Three submits proposed amendment". history.com. A&E Television Networks. February 1, 2019 [First published November 13, 2009]. Retrieved April 13, 2019. ^ a b Christiensen, Hannah. "The Corwin Amendment: The Last Last-Minute Attempt to Save the Union". The Gettysburg Compiler. Gettysburg, Pennsylvania: Civil War Institute, Gettysburg College. Retrieved April 13, 2019. ^ Lupton, John A (2006). "Abraham Lincoln and the Corwin Amendment". Illinois Periodicals Online. Retrieved August 4, 2016. ^ a b c Crofts, Daniel W. (2016). Lincoln and the Politics of Slavery: The Other Thirteenth Amendment and the Struggle to Save the Union. Chapel Hill: University of North Carolina Press. pp. 245–250. ISBN 9781469627328. ^ Resolution 10. Acts of the General Assembly of the Commonwealth of Kentucky, Passed at the Called Session which was Begun and Held in the City of Frankfort, on Thursday, the 17th Day of January 1861 and Ended on Friday, the Fifth Day of April 1861. Frankfort: Commonwealth of Kentucky. 1861. pp. 51–52 – via Google Books. ^ "Adoption of the Corwin Amendment". Providence Evening Press. June 3, 1861. p. 2. ^ "Rescission of Maryland's Ratification of the Corwin Amendment to the United States Constitution". General Assembly of Maryland. Retrieved April 10, 2014. ^ Illinois General Assembly (1863). Public Laws of the State of Illinois Passed by the Twenty-Third General Assembly Convened January 5, 1863. Springfield: Baker & Phillips. pp. 41–42. ^ Martin, Philip L. (March 1967). "Convention Ratification of Federal Constitutional Amendments". Political Science Quarterly. 82 (1): 67–71. JSTOR 2147300. ^ "Slavery: Just a 'Detail'?". The Progress Report. August 13, 2003. Archived from the original on June 26, 2015. ^ Albert, Richard (February 27, 2013). "The Unamendable Corwin Amendment". Int'l J. Const. L. Blog. Retrieved March 2, 2013. Bryant, A. Christopher (2003). "Stopping Time: The Pro-Slavery and 'Irrevocable' Thirteenth Amendment". Harvard Journal of Law and Public Policy. 26: 501. ISSN 0193-4872. Crofts, Daniel W (2016). Lincoln and the Politics of Slavery: The Other Thirteenth Amendment and the Struggle to Save the Union. University of North Carolina Press Books. ISBN 978-1-4696-2731-1. Lee, R. Alton (1961). "The Corwin Amendment in the Secession Crisis". The Ohio Historical Quarterly. 70 (1): 1–26. Martin, Philip L. (1966). "Illinois' Ratification of the Corwin Amendment". Journal of Public Law. 15: 18–91. Suber, Peter (1990). "The Paradox of Self-Amendment (Section on Corwin Amendment)". Walter, Michael (2003). "Ghost Amendment: The Thirteenth Amendment that Never Was". Archived from the original on August 6, 2018. "Abraham Lincoln and the Thirteenth Amendment that Wasn't". This Cruel War Blog. June 16, 2016.